Located off Lucian Sorrels Road. Half a mile north of Timber Creek Trails Merchants with craft brewery, restaurants and shopping attractions. 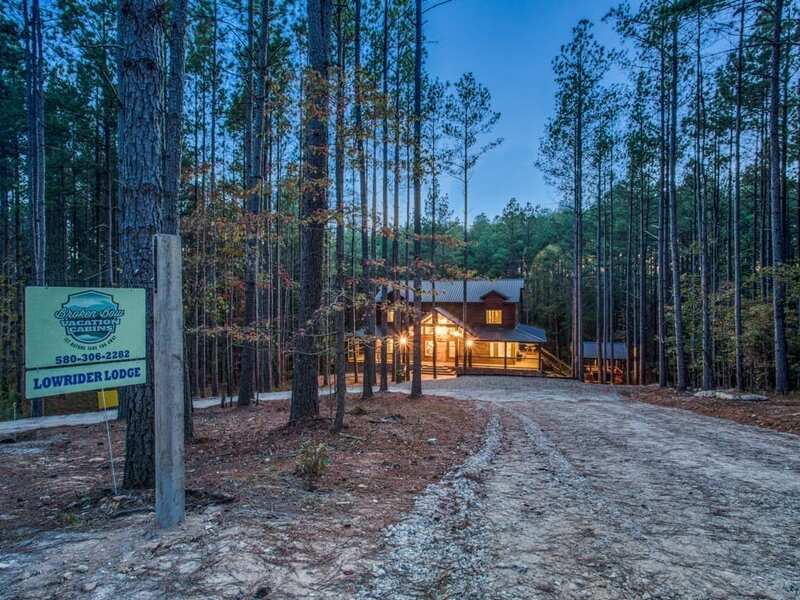 3 miles north of Broken Bow Lake entrance, Beavers Bend State Park and other area attractions. 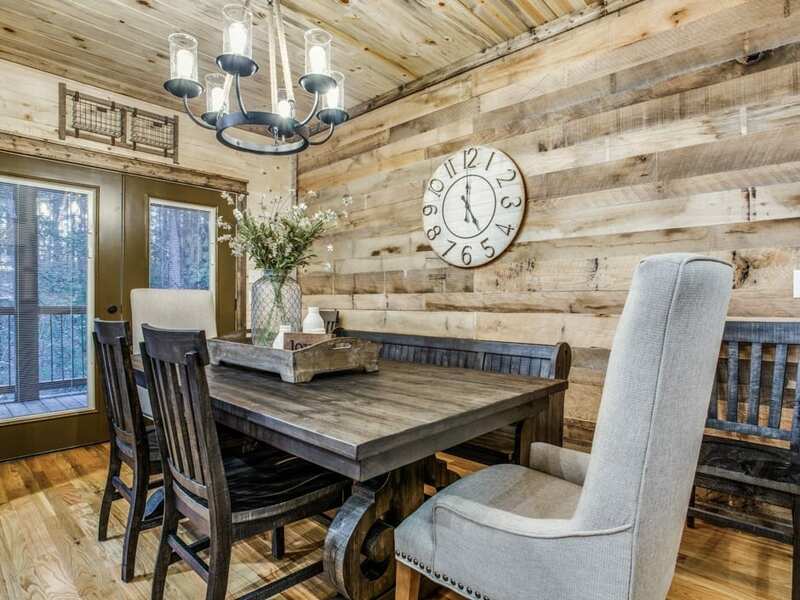 Accommodates up to 18 guests. King bedroom has a bathroom next to it in the hallway with walk-in shower. 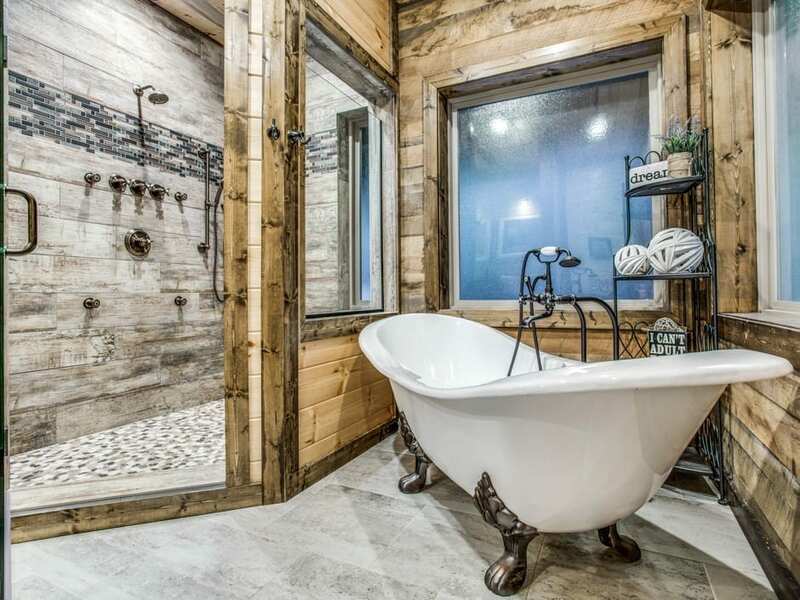 This bathroom will serve guest on main floor. 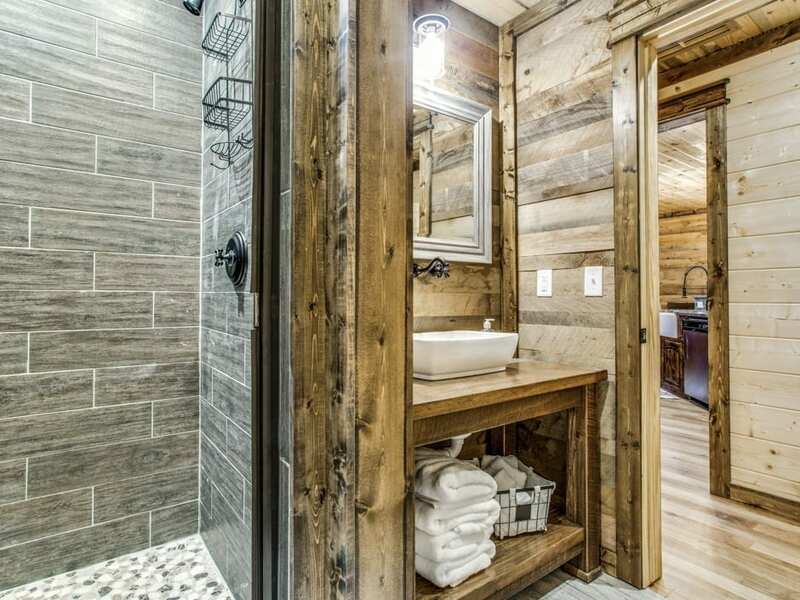 King bedroom has a bathroom next to it in the hallway with shower/tub combo. 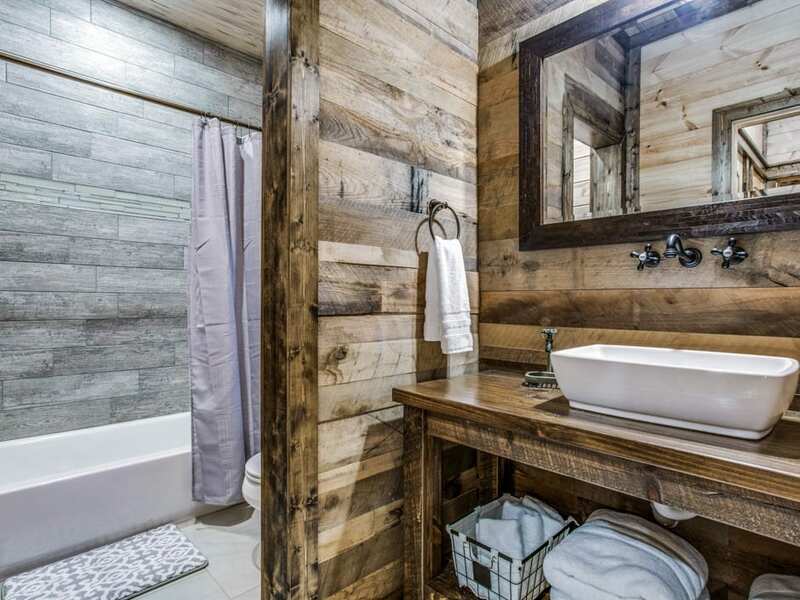 This bathroom will serve the guest who use the queen sleeper sofa in the balcony area. 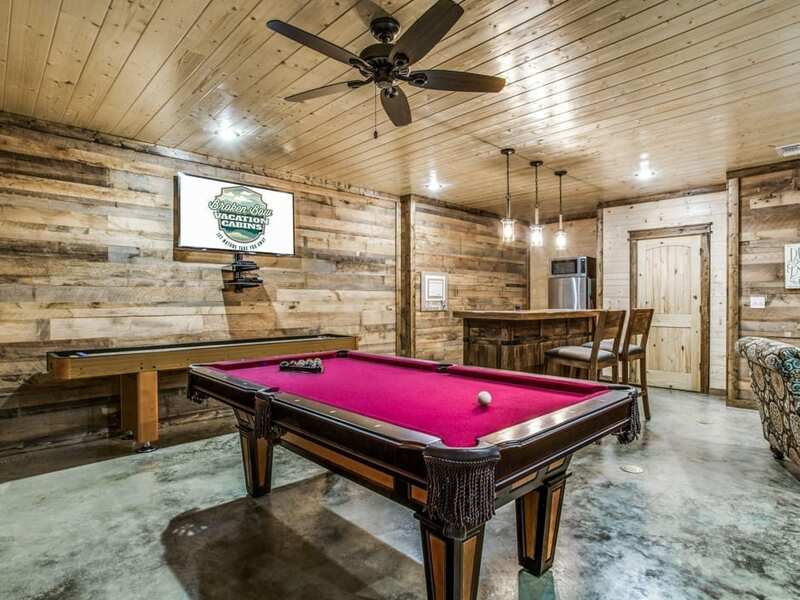 Entertainment area in basement has pool table and shuffleboard. Dining area with large table. 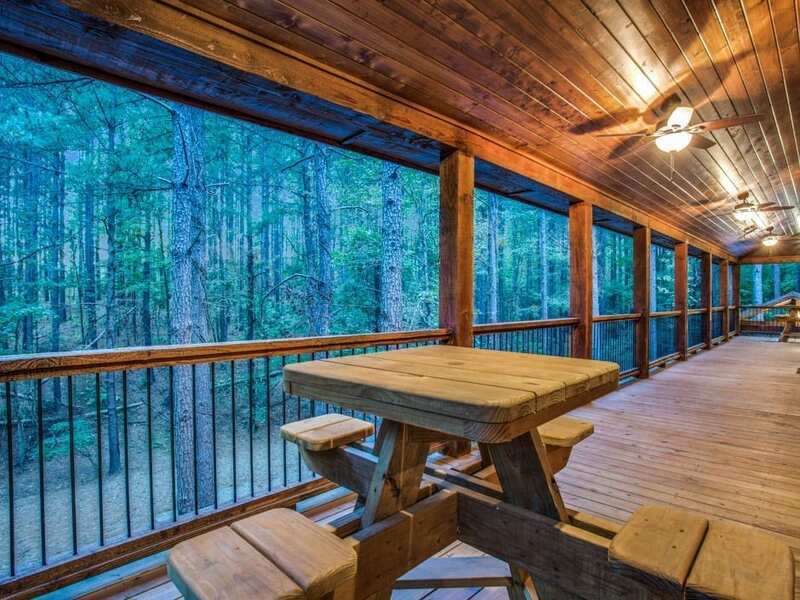 Large covered decks with multiple seating options. Fire pit in gravel yard area. 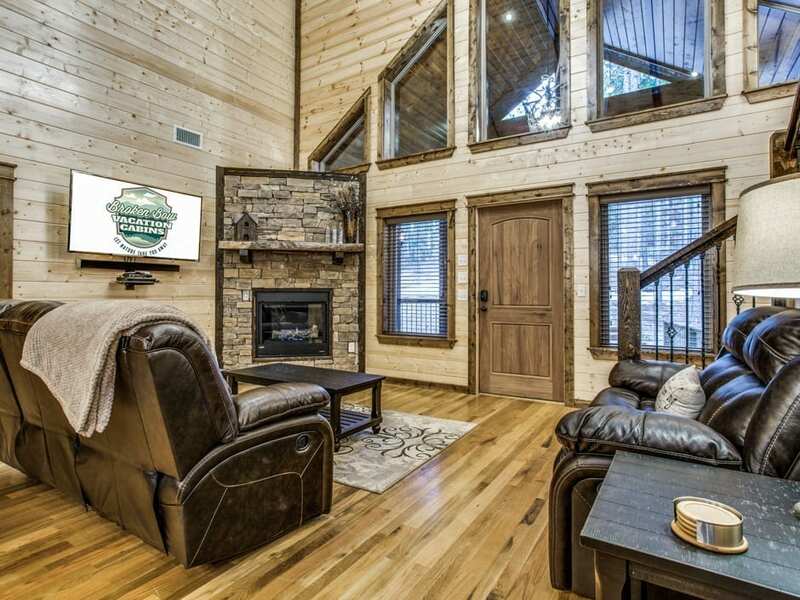 The Low Rider Lodge luxury cabin has everything you could dream of to make your get away one to remember! 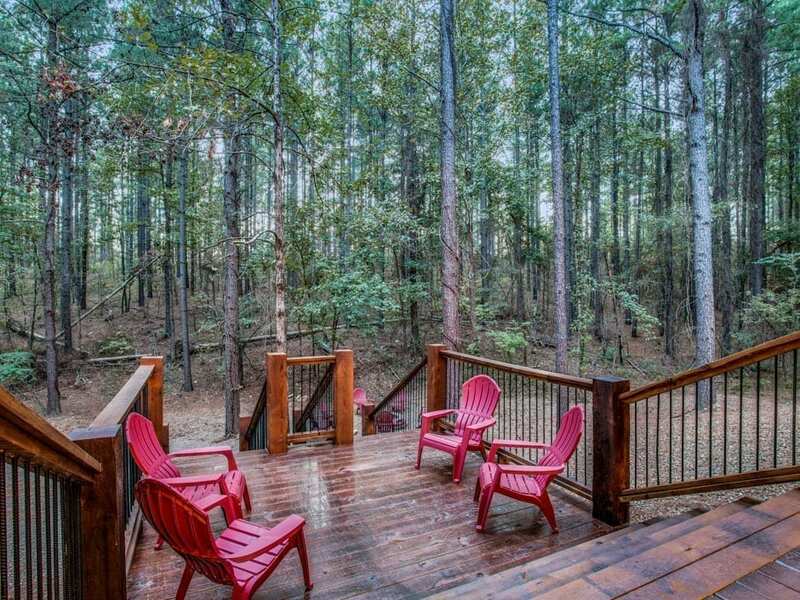 The national forest sits right along the property line which provides breathtaking views as the cabin is tucked inside 60 ft pine trees. 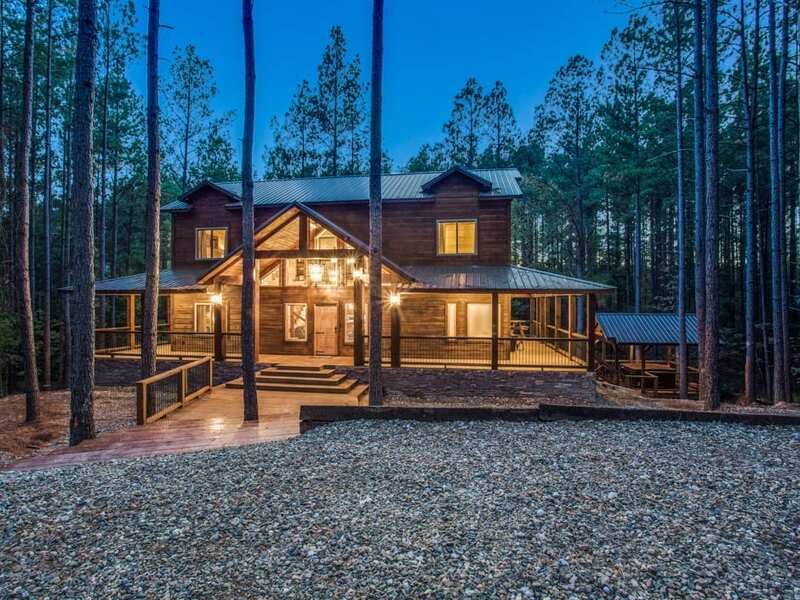 The 1.5 acres that surround this amazing lodge are just a few minutes away from marked ATV trails. So, bring your toys if you’re up for the adventure. You can also hike and mountain bike all over the area if ATVs are not your thing. The trails lead to the river which is a great spot for picnicking and exploring. 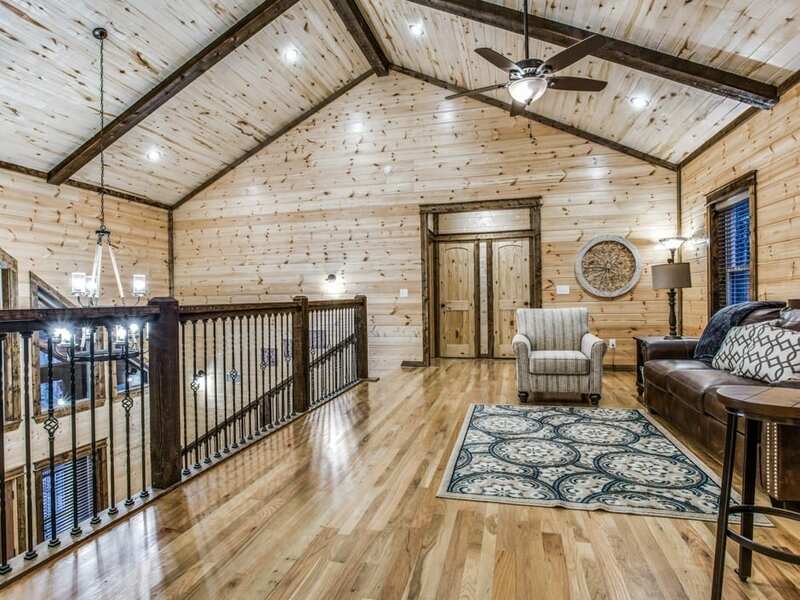 ​As you walk into the front door of this Grande 3 story ​Lodge you’ll be in awe of the gorgeous vaulted ceilings and open floor plan. 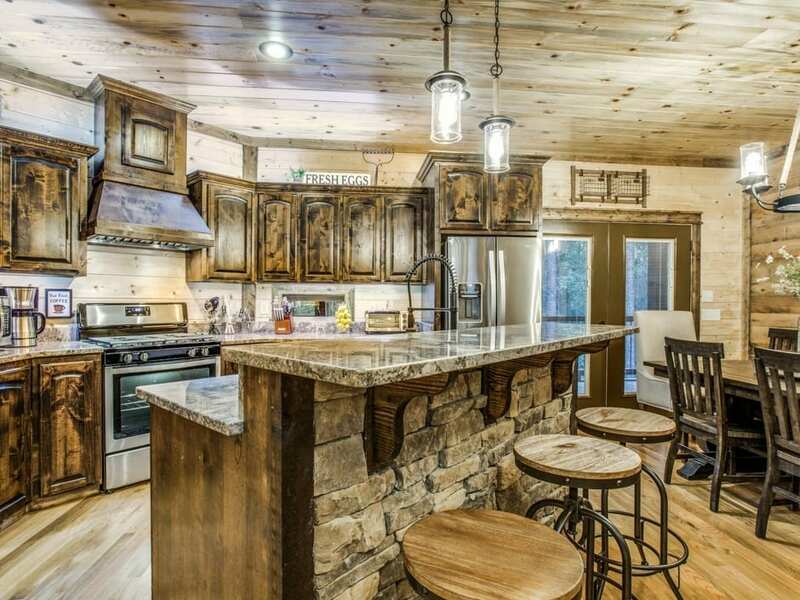 There is a ​fully​ equipped kitchen with beautiful granite counter tops and custom knotty alder cabinets with seating at the island and large table to enjoy your home cooked meals! 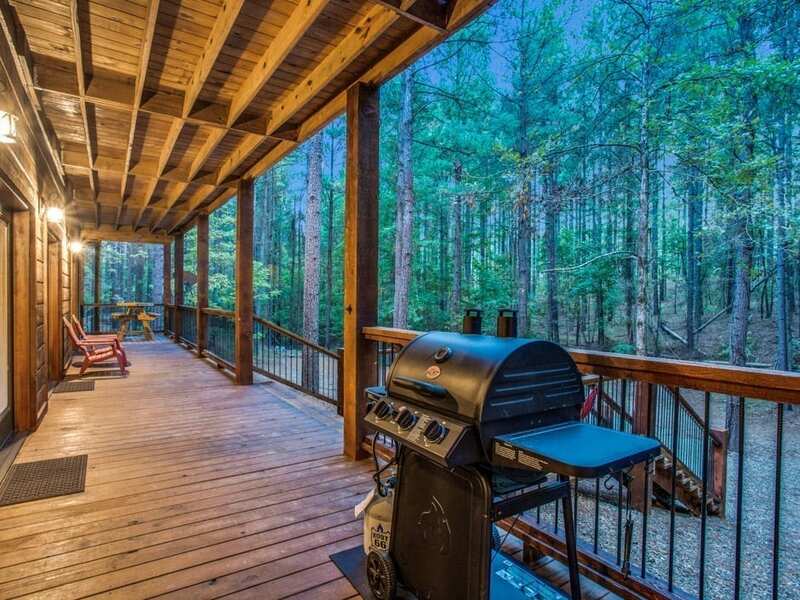 There are​ spacious ​wrap around porches with outdoor seating to enjoy the scenery outside. 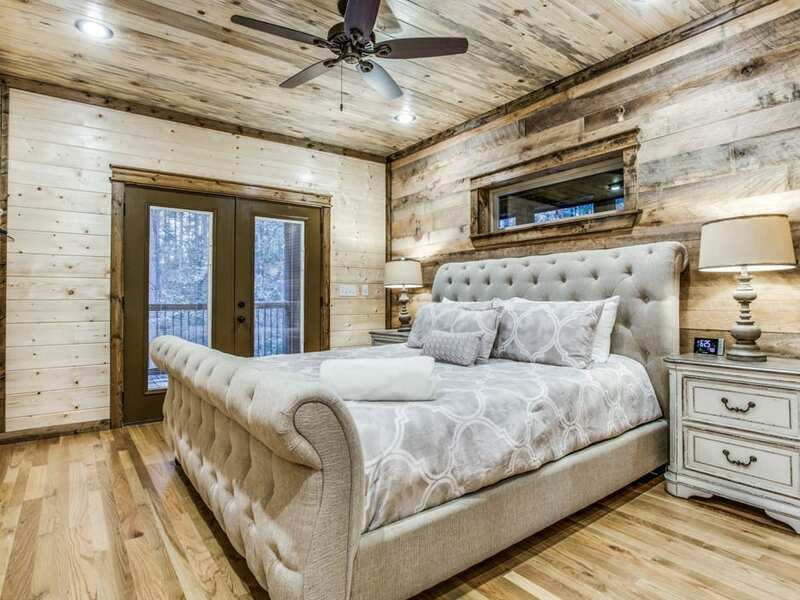 The master bedroom includes a spa-like master bath suite with a soaking tub, a separate walk-in shower, “his and her” custom built ​vanities, and a closed-off bathroom. 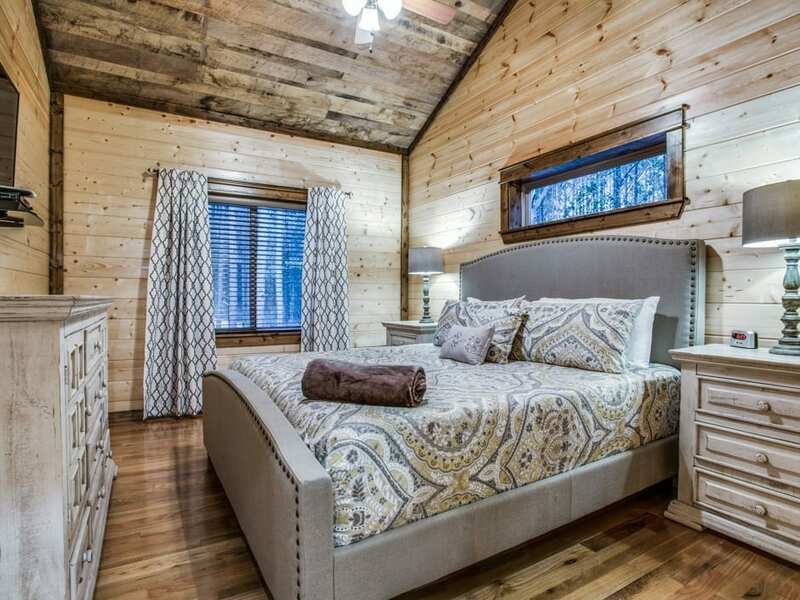 Each bedroom is private with designer furniture and HDTVs for your viewing pleasure. 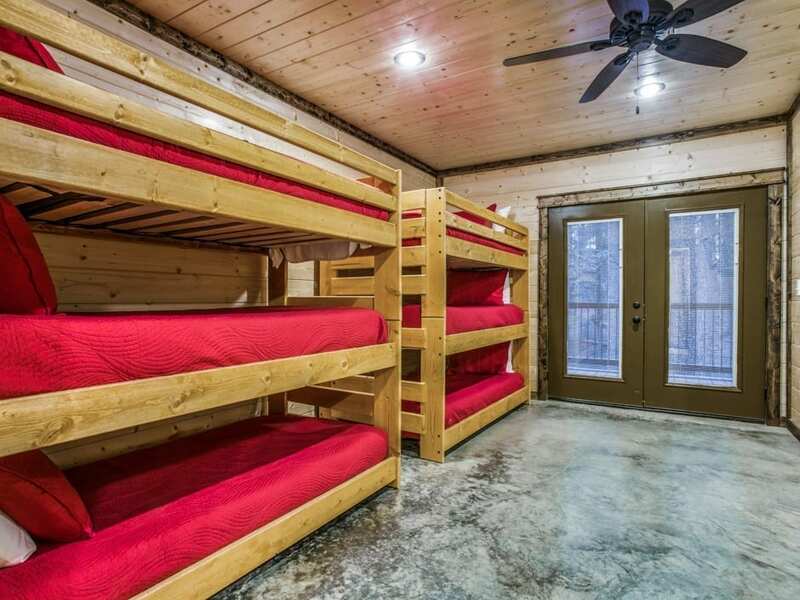 This cabin sleeps 12 adults. 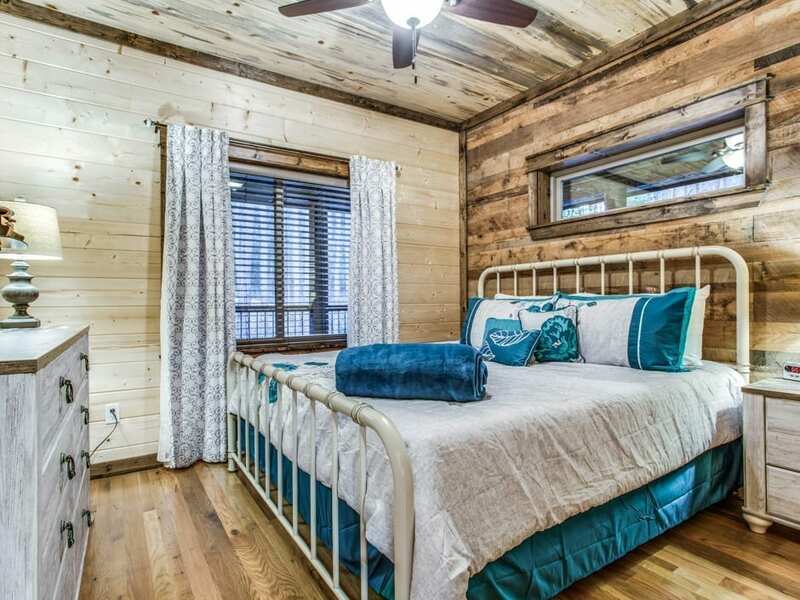 There are 4 private bedrooms which all have king beds, another bedroom with that sleeps 6 in bunk beds (children appropriate), a cozy loft with a sleeper sofa and another sleeper sofa in the basement. 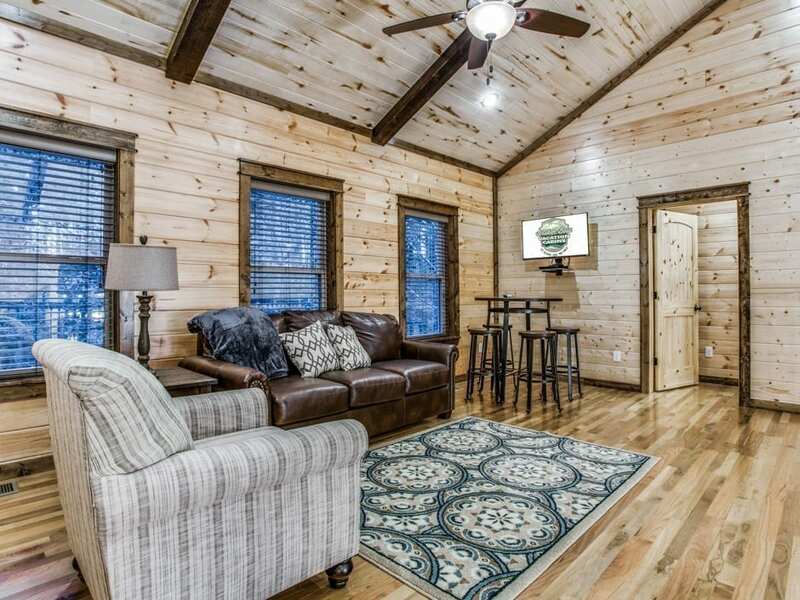 All these accommodations makes this cabin the perfect spacious vacation retreat with an outstanding set up to entertain large groups. 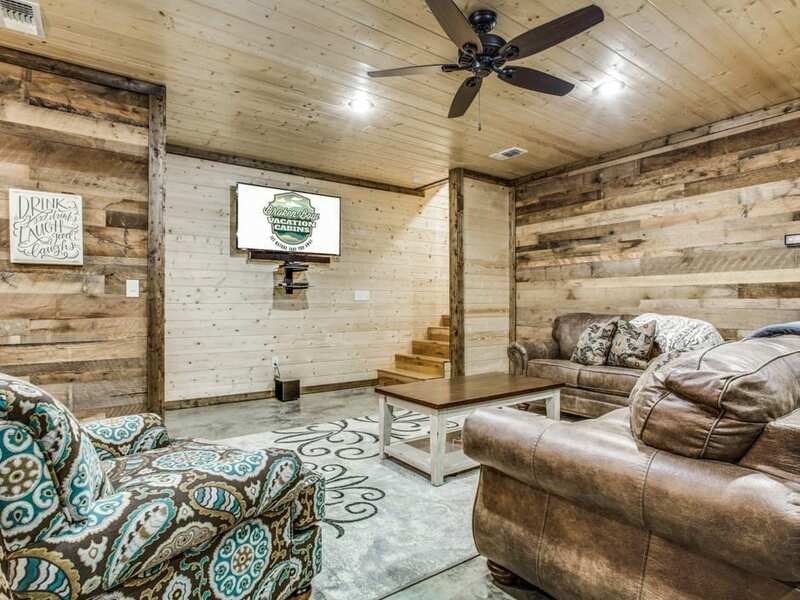 The setting is perfect as the basement opens to a deck that faces the beautiful forest. So make yourself comfortable with some cards or a book and relax while enjoying the scenery. 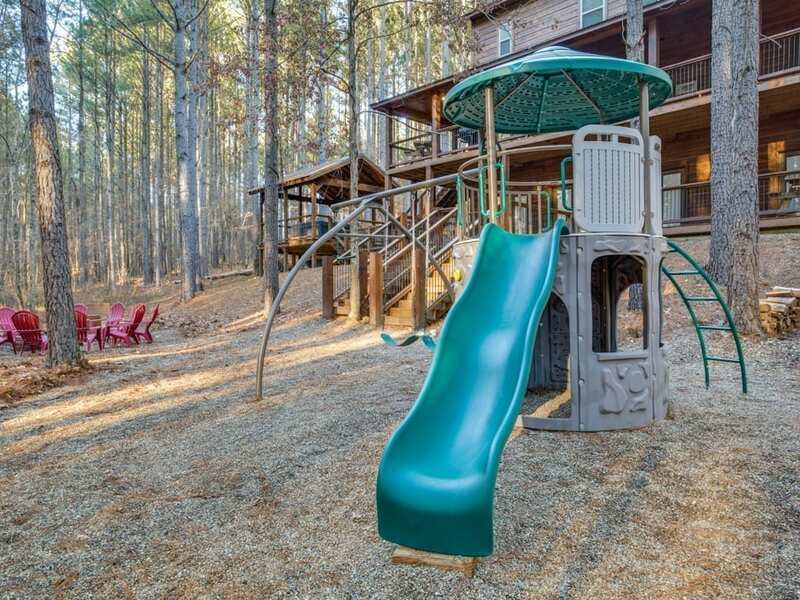 Step further outside to an ​outdoor fire pit and grill, along side a built-in horseshoe pit. 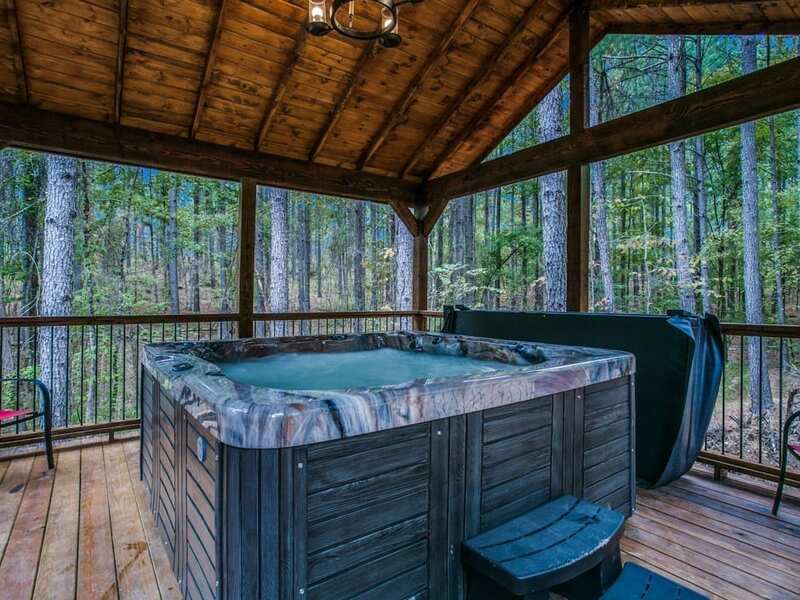 There is hot tub to sink into at the end of the day or step aside and let the kids swim and play. 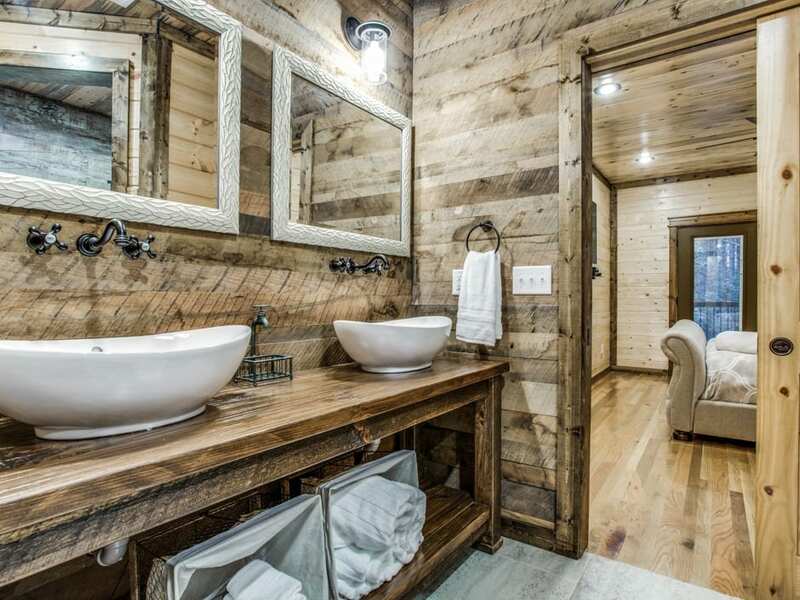 Low Rider Lodge is a rustic-modern luxury cabin that has everything you could ever need to make your stay perfect. 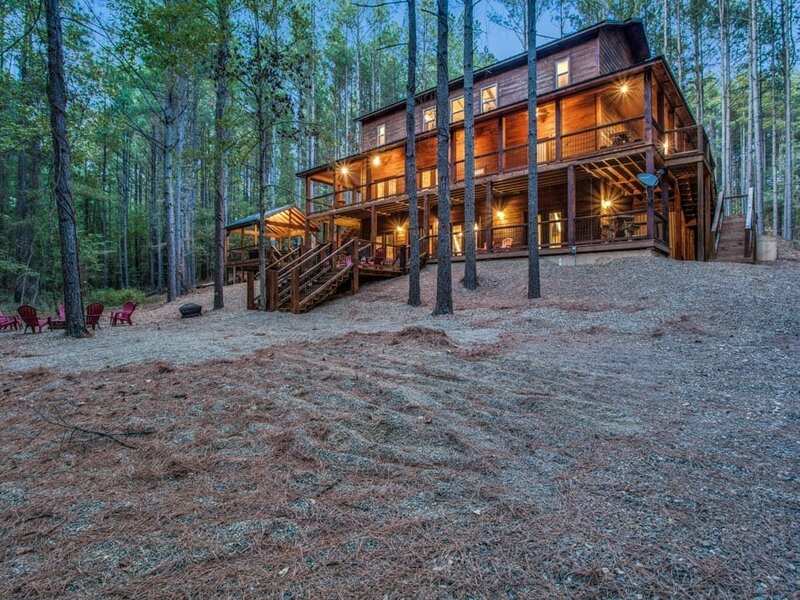 It is only a few minutes drive to Broken Bow Lake and Beavers Bend State Park. 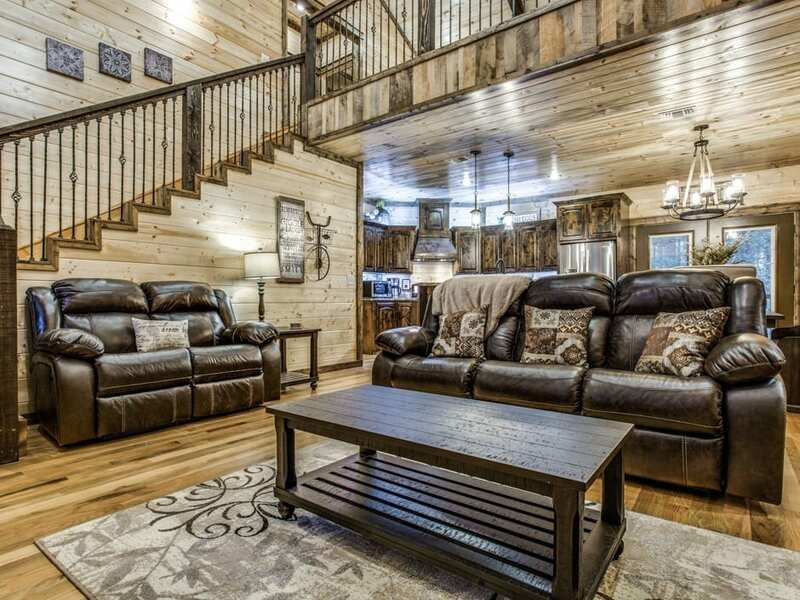 There are multiple great restaurants in the area and various activities very close such as ATV trails, boating, fishing, horseback riding, zip lining​ and more. 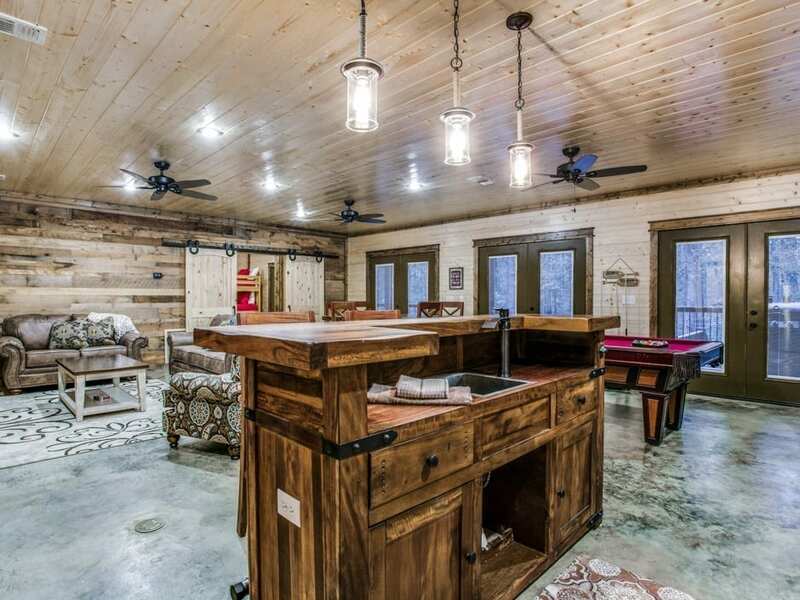 This cabin is great for groups of families and friends, family reunions, fishing trips and team building retreats. 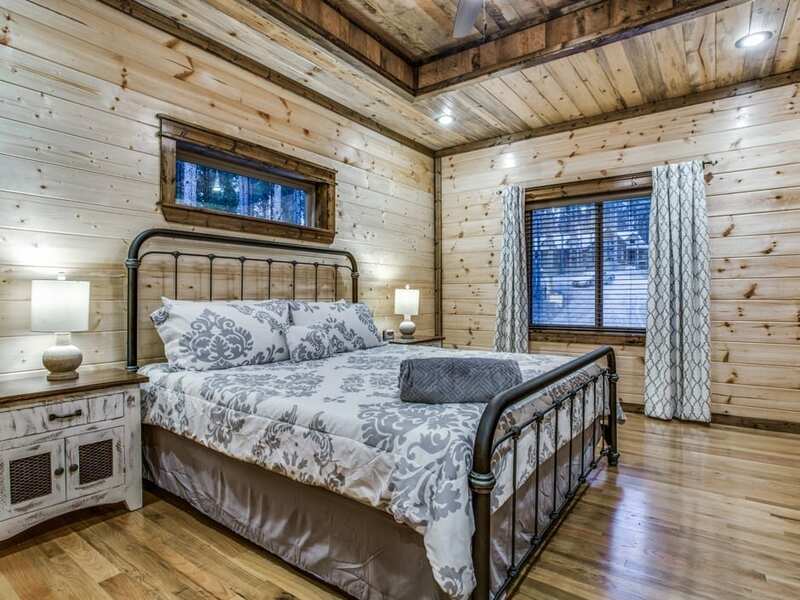 You’ll love your stay at Low Rider Lodge Luxury Cabin.